An average person sleeps 7-8 hours a day. That is one-third of a day since we humans sleep daily, we can say that we sleep one-third of our lives. Where do you sleep? On your mattresses obviously. Now that you spend one-third of your life sleeping on your mattress, it is only a good deal to keep your mattresses clean and fresh. A deep mattress cleaning and not just a simple rub off is a must. In this article, we give you the eco-friendly mattress cleaning. What’s Wrong With Commercially-available Cleaners? Conventional cleaners do provide seemingly good results. But, this result comes at a cost. Conventional cleaning products often contain harsh brighteners and bleaches that can cause irritation to your eyes, lungs, and skin. You must have been particularly aware of this if you’ve ever used one of such products in a badly-ventilated, confined space. Such Chemical cleaners can destroy the pH level of your derma. They can make your skin, experience discomfort and redness. They also happen to typically contain synthetic dyes and fragrances which can irritate your skin and cause other health problems. Moreover, some of these commercially available cleaning products are also petroleum-based and they contain synthetic surfactants. These surfactants are made to break down oils from the stained fabric and help the cleaning product stick to wet surfaces. Eco-friendly cleaning products are gentle both on you and the environment. They’re made from plant-based ingredients so they won’t irritate your body parts. These cleaning products aren’t reliant on fossil fuels. They’re made with biodegradable surfactants that won’t pollute the earth thus they’re better for the earth too. 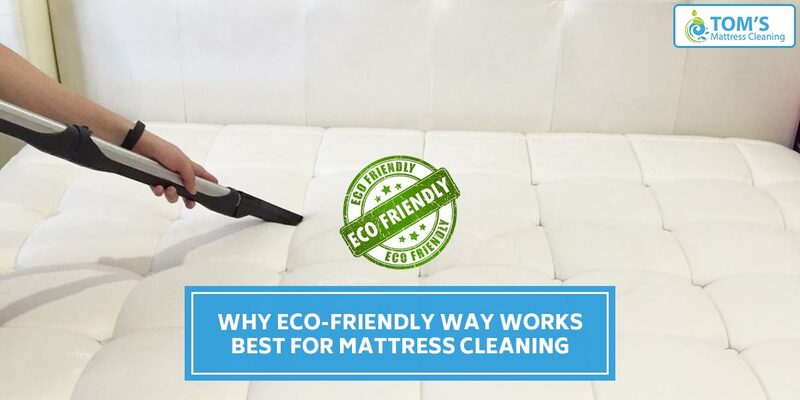 When you use gentle, eco-friendly cleaning methods for your mattress, you no longer live with the threat of harsh chemicals within the environment of your home. Since we breathe in and absorb cleaning fluids from your mattress, throughout the night it is only preferable to go natural. Along with that, it doesn’t give out the smell of chemicals throughout the night. You have to take extra care of your indoor air if you have pets or small children at home. As they are more sensitive to chemicals in general. In this case, chemicals found in common cleaning products. Use eco-friendly methods to prevent any allergies or issues with your pet or your young ones. Eco-friendly cleaners are not harsh to the skin, eyes, and lung they are gentle and do not prove to be any trouble whilst cleaning and post cleaning. You can save money by making your own, all-purpose, eco-friendly mattress cleaning solution, for not only your mattress but every room in your house. It is very easy to make eco-friendly cleaners. It only requires ingredients available one kitchen trip away. Cuts you the cost, helps you being creative. Toms Mattress Cleaning Services in Melbourne, Sydney, and Brisbane is very much sought after. We provide on-site, same-day cleaning services at your convenience. Call us on 1300 068 194.